A community forum regarding Oregon State University’s engineering and construction plans for a marine studies building on the Hatfield Marine Science Center campus in Newport will be held Wednesday, May 24, in Corvallis. When Raul Burriel watched that video, he saw somebody with “considerable experience doing these kinds of interviews.” After all, said the streaming media coordinator for Oregon State University, video dad Robert Kelly had things positioned in just the right way. The video camera is above him, pointing downward. He has positioned his own books strategically on his desk. Cross Laminated Timber (CLT) for wood high-rise buildings will be presented by Valerie Johnson, DR Johnson Lumber, and Iain MacDonald, head of the Tallwood Design Institute launched jointly by Oregon State University and the University of Oregon. A 2016 study suggests that a strong sense of curiosity in employees can equate to a knack for creative problem-solving. The study – carried out by Oregon State University in the US – indicates that employers looking to hire candidates with creative problem-solving abilities would do well to test for curiosity as a personality trait during the recruitment phase. Dozens of people posted about the mystery smell on social media, with reports coming in from downtown, south Corvallis, Timberhill, Oregon State University, the Crystal Lake Sports Fields and Good Samaritan Regional Medical Center. Undergraduate Engineering Expo – The College of Engineering invites you to the 2017 Undergraduate Engineering Expo on Friday, May 19 from 11 a.m.- 4 p.m. in the Kelley Engineering Center, Johnson Hall, and the community plaza. This Senior Design Showcase features nearly 200 student-built projects from all engineering disciplines. Free and open to the public. NEW! Open Forums for Writing Center Coordinator candidates: The Writing Center invites campus and community partners to attend candidates’ presentations on the topic of developing strategies to welcome and support underrepresented and international students in the Undergraduate Writing Studio. Please join us during the following dates and times: Chris Ervin, May 19, 11-11:50 a.m., Valley Library Willamette West; Mark Petterson, May 22, 10-10:50 a.m., Valley Library Willamette East; Chris Nelson, May 24, 10-10:50 a.m., Valley Library Willamette East; and Alyssa Roth, May 25, 10-10:50 a.m., Valley Library Willamette West. Position information and candidates’ bio information will be available at the sessions, along with a more detailed presentation description. For accommodations related to disability, please contact Dennis.Bennett@oregonstate.edu or 541-737-5640. Music a la Carte: OSU String Quartet performs Borodin, Ravel and Dvorak. Friday May 19, Noon, Memorial Union Lounge. Free. Disabilities Studies: Join a group of OSU community members interested in discussing Disability Studies teaching and research, in general, and the development of a DS curriculum at OSU, in particular. Gloria Krahn will present, “On Quality of Life with Functional Limitations” Friday, May 19, noon, Milam Hall 301. Tan Sack Lecture Series: Thomas Love – Linfield College, will speak on “Late Modernity: Time, Net Energy Decline, and the Red Queen Effect,” May 19, noon, Waldo 201A. Department of Fisheries and Wildlife defense: Imam Basuki, PhD Defense – How land cover change affects carbon dynamics in tropical coastal peatlands? Friday, May 19, 1 p.m., Nash 032. Open Forums for Supplemental Instruction (SI) Coordinator candidates: The Academic Success Center invites campus and community partners to attend candidates’ presentations on the topic of their approach to developing peer educators. Please join us during the following dates and times: May 19, 2-2:50 p.m., Waldo Hall (Rm 400). Position information and candidates’ bio information will be available at the sessions, along with a more detailed presentation description. For accommodations related to disability please contact success@oregonstate.edu or 541-737-2272. Queer Family Talks: Join the Pride Center to learn from a panel of students, faculty and staff about their experiences being a part of a queer family dynamic, and how they give and receive support within their family structure. Audience members are also encouraged to share their experiences in open discussion throughout the event. Friday, May 19 at 5 p.m., MU Journey Room. Click here for Facebook event page. Author reading: Author Karen Russell will give a reading of her work on Friday, May 19, at 7:30 p.m. in the Valley Library Rotunda. The reading will be followed by a Q&A and book signing, and is part of the School of Writing, Literature, and Film’s 2016-2017 Visiting Writers Series. Day of Caring: Registration for the Center for Civic Engagement’s (CCE) Day of Caring Service Projects on Saturday May 20 is now OPEN! Students, staff, and faculty are invited to participate in this day of service. Check-in will be on campus in the MU Lounge with transportation provided from there. These projects allow participants the opportunity to engage in their local community, build relationships, make impactful changes, and begin to shape the type of community they want to live in. CCE is partnering with the United Way of Benton & Lincoln Counties and the Alumni Association to host this event. Many projects can accommodate children and youth as well. Pre-registration is required for Day of Caring, so be sure to reserve your spot by signing up here: http://sli.oregonstate.edu/cce/dayofcaring. Cherry Poppin’ Daddies Concert: Come enjoy their high-energy blend of swing, ska, and big band on Saturday, May 20 at The LaSells Stewart Center. Concert begins at 7 p.m. (doors open at 6 p.m.). Tickets include food and beverages. Specially priced student tickets will be available at the door for $20 and includes appetizers and desserts. Must have student ID. This event is a fundraiser for da Vinci Days of Corvallis, a non-profit organization that provides the STEAM Series and Summer Festival at no charge to attendees. NEW! Corvallis-OSU Symphony Society and OSU School of Arts & Communication present: “Music Transcendent” featuring the music of Debussy, R. Strauss, and Wagner Tuesday, May 23, 7:30 p.m. at The LaSells Stewart Center. Tickets: COSUsymphony.org or 541-286-5580. Student and CAFA discounts apply. Film showing: Ray: The story of the life and career of the legendary rhythm and blues musician Ray Charles, from his humble beginnings in the South, where he went blind at age seven, to his meteoric rise to stardom during the 1950s and 1960s. Film will be captioned. Monday, May 22, 6 p.m. Milam Hall, 319. Co-sponsored by Disability Access Services and the OSU Disability Network. Board of Trustees: The Executive & Audit Committee of the OSU Board of Trustees will hold a telephonic meeting from 4-5 p.m. on Tuesday, May 23, to consider the proposed 2018 and 2019 Board calendars, the election of a Board chair, and the presidential assessment policy. The committee will also discuss the upcoming at-large Board position vacancy and hear a progress report from the Office of Audit Services. The meeting is open to the public. Members of the public may listen to the meeting by calling the toll-free number listed on the agenda. The MU Allworth Conference Room (207) will also be open to the public as a site for listening to this meeting. The agenda and meeting materials will be posted at http://oregonstate.edu/leadership/trustees/meetings. Accommodation requests should be made at least 48 hours in advance to the Office of the Board of Trustees, Marcia Stuart, 541-737-3449. UPDATED: Faculty Appreciate Days at Goss: Join OSU Athletics for Faculty Appreciation Days at Goss Stadium at Coleman Field as the No. 1 ranked baseball team concludes the regular season Memorial Day Weekend. Reduced priced tickets include $13 Reserved Seats and $5 General Admission. Follow these links to get your Faculty Appreciation game-day tickets. https://tinyurl.com/k5w7q8t (May 25) https://tinyurl.com/l9pmxzx (May 26). NEW! Water Resource Policy & Management defense: Rianne BeCraft, MS Dissertation – Indigenous Approaches to Water Conflict Management: the Anuak and their Approaches to Water Conflict Negotiation. Monday, May 22, 3 p.m., KEC 1001. Rianne is advised by Michael Campana of CEOAS. NEW! Knowledge Discovery from Soil Databases: James Bockheim, Professor Emeritus professor in Department of Soil Science, University of Wisconsin, Madison, will give the 2017 Benno P. Warken Lecture on “Knowledge Discovery from Soil Databases”. He will speak on May 22 from 4 to 5 p.m. in ALS 4000. Hosted by Department of Crop and Soil Science, OSU. Free and open for public. NEW! Tuesday Teaching Talks: Join colleagues and the Center for Teaching and Learning (CTL) every Tuesday for just-in-time-teaching workshops. Attend one or all. Certificates are provided to those who complete at least eight sessions. On May 23, we will explore approaches for Evaluating & Responding to Student Work. This 90-minute workshop will be facilitated twice in Milam 215 at 10 & 2. No need to register – just come on by! Learn more here. Contact us here. NEW! Our shrinking cryosphere: James Bockheim, Professor Emeritus professor in Department of Soil Science, University of Wisconsin, Madison, will give the 2017 extended Benno P. Warken Lecture on “Our shrinking cryosphere”. He will speak on May 23 from 9 to 10 p.m. in BURT 193. Hosted by Department of Crop and Soil Science, OSU. Free and open for public. NEW! Gatekeeper Suicide Prevention Training: Did you know that suicide is the second leading cause of death amongst college students? This workshop will teach participants to recognize the warning signs and how to help if someone they know is thinking about suicide. Suicide is preventable and depression is treatable – you can help save a life. May 23, noon-1:30 p.m, MU Journey Room. Feel free to bring your lunch. NEW! Curriculum Innovation lecture, May 23: World-renowned open learning pioneer Candace Thille (Stanford University) will speak on faculty collaboration and curriculum innovation on Tuesday, May 23 from 3-3:50 p.m. in the CH2M Hill Alumni Center. Open to the OSU community. Hosted by the OSU Division of Undergraduate Studies & the University Innovation Alliance. Campus START orientation information session: New Student Programs & Family Outreach invites all OSU employees to attend a presentation on the details of our START summer orientation program at OSU. Presentation will cover a typical START session agenda, dates of sessions and FAQs you may get working on campus this summer. Two identical info sessions will be held: May 22 at 1 p.m. in MU 208; May 25 at 10:30 a.m. in MU 208. Questions & requests for disability accommodations can be sent to Natalie.Rooney@oregonstate.edu. Department of Integrative Biology Seminar: Tara Smiley, Postdoctoral Scholar, Oregon State University will present a seminar, “Mountains & Mammals; Linking Landscape & Climate Change to Diversification in Neogene Rodents” on Monday, May 22, at 3:30 p.m. The seminar will be held in ALS 4001. It is free, open to the public and refreshments will be served prior. Psychological Science spring colloquium: Erika Frandrup: Veteran Transitions and Identity Change Within Higher Education: Stigmas, Perceptions, and Institutional Betrayal . Raechel Soicher: Metacognition, Structure-building, and Scientific Literacy. May 22, 4-5 p.m., Reed Lodge, room 111. Animals Strike Curious Poses – Elena Passarello Reading and OSU Authors and Editors Reception: 2015 Whiting Award winner Elena Passarello is an actor, writer, and assistant professor of creative writing in OSU’s School of Writing, Literature, and Film. Her first book, Let Me Clear My Throat, won the Independent Publisher’s gold medal for nonfiction and was a finalist for the Oregon Book Award. This Recognizing Excellence event celebrating recent books published by OSU faculty is sponsored by the Office of the Provost and hosted by the OSU Center for the Humanities. Monday, May 22, 6:30 p.m., Autzen House, 811 SW Jefferson Avenue. Sensory Evaluation of Wine Course. Hurry! One-of-a-kind course in the heart of the Willamette Valley – ideal for tasting room managers, winery staff and wine enthusiasts. Learn more. Leadership Collaborative I (LCI) Applications for the fall, 2017 LCI session are now being accepted! The LCI includes 6 sessions on Emergent Leadership. The LCI features engaged, self-directed learning; team-approach; practical, effective tools & skills; and on-the-job implementation. All OSU employees are encouraged to apply. Learn more and submit your application at http://hr.oregonstate.edu/lc1-emergence This is the only LCI session offered this academic year. Faculty presenters sought for “Healthy Economy” event: The Division of International Programs and the Research Office are hosting an event on June 6 from 5-7 p.m. in the Hallie Ford Center highlighting faculty international research. Interested faculty members whose international research falls under the topic of “Healthy Economy” should contact Stacy Jeffries (stacy.jeffries@oregonstate.edu) by Tuesday, May 23. Marine Studies Initiative Survey: The Marine Studies Initiative is asking the OSU community to complete a brief questionnaire to help gauge your familiarity with the program. Your participation will play a crucial role in planning. The questionnaire should take less than 5 minutes to complete. https://tinyurl.com/survey-msi This survey is confidential. For more information: marinestudies@oregonstate.edu or Facebook. Apply now for Ecampus professional development funds: Oregon State Ecampus invites faculty, staff and administrators to pursue professional development related to online and hybrid education. Further your professional goals while promoting effective teaching and learning in OSU’s online and hybrid courses. Funding is available for professorial faculty and professional faculty and advisors. The application deadline is June 7, so learn more and apply online today. Volunteers needed for the Great Move Out: Volunteers are needed to staff the upcoming Move Out Donation Drive, assisting with receiving and sorting donations. Volunteers are needed for the off-campus event on June 14 and 15; details and sign-up here. And for the res. hall event June 8-20; details and sign-up here. Shifts will be held at the OSUsed Warehouse and Surplus Property (644 SW 13th Street) and Benton County Fairgrounds (110 SW 53rd Street). NEW! 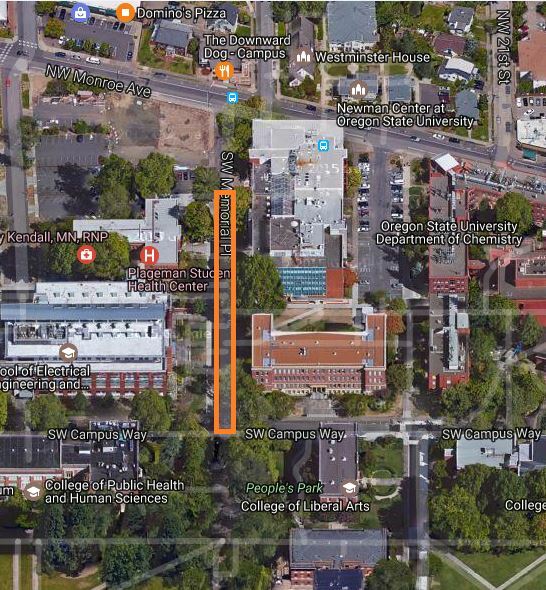 Memorial Place: As part of the Undergraduate Engineering Expo, Memorial Place will be closed on Friday, May 19, all day, from Campus Way to the driveway on the north side of Plageman Student Health Center (map). Administrative Program Assistant – The Office of Global Opportunities invites applications for a full-time (1.0 FTE), 12-month, Administrative Program Assistant position. Posting #P00904CT. Closes May 19. Academic Technologies is recruiting for one part-time, Student Information Technology (Data Analyst) position. This position will be supporting TAC assessment and research projects. Posting # P02227SE. Closes: May 19. Student Initiatives Coordinator: The Department of Recreational Sports at Oregon State University welcomes initiative, organizational excellence, and passion for student development. Inviting applications for a full-time (1.0 FTE), 12-month professional faculty position. Posting # P01226UF. Closes May 19. MBA Recruiter – The College of Business invites applicants for a full time (1.0 FTE) 12-month, MBA Recruiter position located in Portland, OR. Posting # P01243UF. Closes May 19. Administrative Assistant to the Associate Dean of Student Life – The Office of Student Life in Corvallis. Invites applications for a full-time (1.0 FTE) Salary, 12-month Administrative Assistant to the Associate Dean of Student Life, Post # P01274UF, Closes May 21. Student Game Show Host – Student Health Services invites applications for 5 part-time student employees to host the START summer game show. This activity is used to educate incoming first-year students on SHS programs, services, as well as health and community resources. Posting #: P02219SE Additional application requirements: http://oregonstate.qualtrics.com/jfe/form/SV_6SvMdQCNT5aNPp3. Closes May 21. This recruitment will be used to fill one full-time Administrative Program Assistant position for the Office of the Registrar at Oregon State University. This is a limited duration appointment expected to last approximately 1 year from the appointment begin date. Posting #P00945CT. Closes May 22. The Linus Pauling Institute (LPI) is recruiting for an Administrative Program Assistant. This is a limited duration appointment expected to last approximately 1 year from begin date. Posting # P00947CT. Closes May 31 with a full-Consideration date of May 22. Student Health Services invites applications for a full-time (1.0 FTE), 9-month, Advanced Practice Clinician (NP/PA- Mid-Level Practitioner), Posting #P00908CT. Closes May 22. Education Abroad Director (Internal Opportunity) – The Office of Global Opportunities invites applications for a full-time (1.0 FTE), 12-month, Education Abroad Director position. Posting #P01282UF. Closes May 22. This is an internal employment opportunity. Temporary Lifeguard – This recruitment will be used to fill two part-time Lifeguards for the 4-H Oregon Conference/Education Center at Oregon State University (OSU). These positions will be located in Salem, Oregon. Posting# P00921CT. Closes May 22. Memorial Union invites applications for a full-time (1.0 FTE), 12 month, Project Coordinator position. Position focus is event management and coordination. Posting #P00902CT. Closes May 22. Internal Employment Opportunity – Assistant to Executive Director – The Office of Career Development Center in Corvallis. Invites applications for a full-time (1.0 FTE) Salary, 12-month Assistant to Executive Director, Post # P01313UF, Closes May 23. Oregon Sea Grant is recruiting for a 0.5 FTE, classified, administrative program assistant (content strategist). This position will report work performed by Sea Grant-funded individuals to the National Sea Grant Library and plan and implement ways to disseminate OSG-related content and amplify awareness of the value of Oregon Sea Grant. Position is based at OSU. Posting # P00936CT, Closes: June 6. Full consideration date: May 23. Office Assistant – This recruitment will be used to fill one part-time, intermittent Office Assistant for the Wallowa County Extension Office at Oregon State University (OSU). This position will be located in Enterprise, Oregon. Posting# P00948CT. Closes May 25. Program Coordinator – The Office of Global Opportunities invites applications for a full-time (1.0 FTE), 12-month, Program Coordinator position. Posting #P01304UF. Closes June 2. For full consideration, please apply by May 26. UPDATED! Immigration Programs Specialist– The Office of International Services invites applications for a full-time (1.0 FTE), 12-month, Immigration Programs Specialist position. Posting #P00949CT. Closes June 2. For full consideration, please apply by May 26. Education Placement Internship Coordinator. OSU-Cascades in Bend, Oregon is seeking applicants for a full-time (1.0 FTE) 12-month, fixed term professional faculty position as Education Placement Internship Coordinator. The Education Placement Internship Coordinator conducts, facilitates, and oversees Teacher Education and School Counseling program students in their clinical field placements. Posting # P01300UF. The full consideration date is May 25 and the closing date is May 29. Health and Safety Coordinator – The Office of Global Opportunities invites applications for a full-time (1.0 FTE), 12-month, Health and Safety Coordinator position. Posting #P01283UF. Closes May 29. Analyst Programmer (Web Developer) – The Extension and Experiment Station Communications unit invites applications for a full-time (1.0 FTE) Web Developer. Posting # P00911CT. Closes May 29. The Center for Genome Research and Biocomputing is seeking an Office Manager. This is a full-time (1.00 FTE), 12-month, fixed term professional faculty position. Posting # P01281UF. Closes: May 29. Linus Pauling Institute is hiring one Education Program Assistant 2, (approximately 32 hours per week). This is a limited duration appointment expected to last approximately 1 year, 6 months from the appointment begin date. Posting # P00939CT. Closes May 30. Accountant 1 – The Forestry, Oceanic and Atmospheric Business Center invites applications for a full-time (1.0 FTE), 12-month, Accountant 1 position. Position #P00932CT. Full consideration May 26. Closes May 31. Finance and Accounting Manager – The Arts and Sciences Business Center (ASBC) at Oregon State University is seeking a Finance and Accounting Manager. This is a full-time 1.0 FTE, 12-month, fixed term professional faculty position. Posting # P01314UF. Closes May 31. Course Development Student Worker – OSU Extended Campus invites applications for 1-4 part-time (a maximum of 20 hours per week) hourly, course development student worker. This position works closely with various members of the Instructional Design team of the Course Development and Training Unit of Ecampus to help with the process of building online courses and on-going course maintenance through a variety of tasks. Posting #P02121SE. Closes May 31. Assistant Director of Advertising & Marketing. – Orange Media Network invites applications for a full-time (1.0 FTE), 12-month, Assistant Director of Advertising & Marketing position. Posting #P01294UF. Reappointment is at the discretion of the Director. Closes June 2. Associate Director of Journalism. – Orange Media Network invites applications for a full-time (1.0 FTE), 12-month, fixed term professional faculty position. Posting #P01295UF. Reappointment is at the discretion of the Director. Closes June 2. Program Technician 2 – The Research Administration office in the College of Engineering invites applicants for a full time (1.0 FTE), 12 month, Program Technician 2 position. The position provides grant proposal support, develop budgets, interprets and advise on policy and procedure related to sponsored programs, and manages a dynamic workload with strict deadlines. Posting # P00944CT. Apply by June 2 for full consideration. This recruitment will be used to fill one full-time Analyst Programmer, competency level 1, position for Enrollment Management Info Tech at Oregon State University (OSU). Posting #P00930CT. Closes June 2. Civic Engagement Coordinator – Student Leadership & Involvement in the Division of Student Affairs is seeking a Civic Engagement Coordinator. The Civic Engagement Coordinator will facilitate a wide range of civic learning and engagement opportunities and advance a culture of civic engagement and co-curricular community-based learning on campus, specifically throughout Student Affairs and via one-time projects and programs. This is a full-time, 1.00 FTE, 12-month, fixed term professional faculty position. Posting # P01275UF. Closes June 2. Small Animal Orthopedic Surgery Technician: The College of Veterinary Medicine’s Veterinary Teaching Hospital will begin review of applications in the University’s Veterinary Technician 2 pool on June 5. Applicants must be Certified Veterinary Technicians to be considered. Interested parties should apply to posting # no later than midnight on June 4. Posting #P00671CT. Grants and Contracts Coordinator– The University Administrative Business Center invites applications for a full time (1.0 FTE), 12 month, ODS Grant Coordinator. The hiring of this position is contingent on receipt of legislative funding. Posting # P00954CT. Closes June 5. Procurement, Contracts and Materials Management is seeking a Contract Manager. This is a full-time (1.0 FTE), 12-month fixed term professional faculty position. Reappointment is at the discretion of the Director. Position Number: P01247UF. Closes June 12. IMPACT Program Instructor – Student Health Services invites applications for a .49FTE graduate assistant, 9-month appointment for Academic Year 2017-2018. Details can be found here: http://studenthealth.oregonstate.edu/about-shs/jobs. Open until filled. Corvallis: “The sun,–the bright sun, that brings back, not light alone, but new life, and hope, and freshness to man–burst upon the crowded city in clear and radiant glory.” ~ Charles Dickens. Sunny today, high of 75, low of 48. Sunny and warm all weekend. Central Oregon: Sunny, high of 73, low of 41. Sunny all weekend. Newport: Sunny, high of 63, low of 46. Sunny all weekend.